OS Grid Reference: SD 6553 4678. On a tree-clad limestone hill above the River Hodder at Whitewell in the Forest of Bowland, Lancashire, there is a large cave or rock shelter where, from Prehistoric times, evidence of human habitation has been found. The cave is located on the south-facing slope of New Laund Hill, just to the south of New Laund farm. There are two smaller caves close by, but this larger cave proved to be of great archaeological interest back in the late 1940s, 1960s, and again in more recent years, when there were many finds including a fragment of a Bronze Age collared funery urn. To reach Fairy Hole Cave cross over the River Hodder via the stepping stones opposite St Michael’s church, and head up beside the woods for 300m or so. There are two footpaths, the first might not be accessible, but on the second footpath at New Laund farm walk to the southwest (above the woods) for 215m; then walk down into the woodland to find the larger of the three caves on this south-sloping side of the hill, high above Whitewell and the River Hodder. 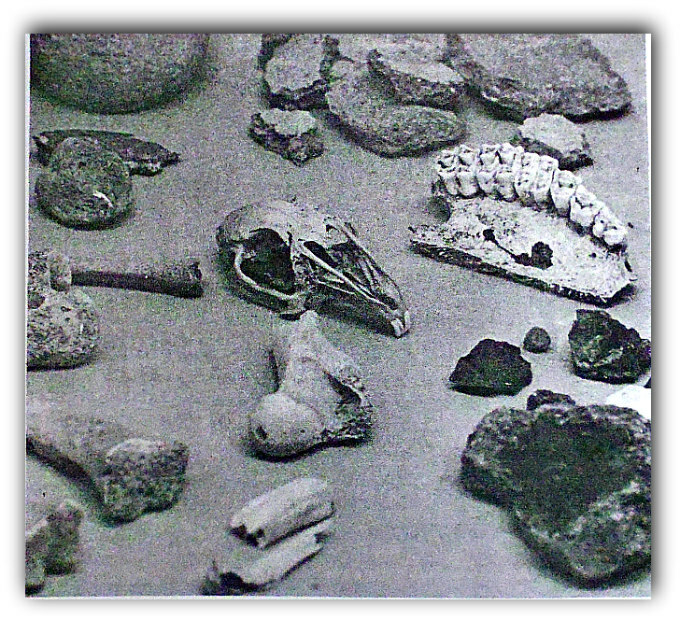 Fairy Holes Cave, Whitewell (artefacts). The site entry ( No. 9) in the‘Lancashire Archaeological Bulletin’ (1984) for the parish of Bowland-with-Leagram. Site Name: Fairy Hole Cave. N.G.R. SD 655 468. Primary Reference: Musson 1947. Disposition of Finds: L.C.M.S. 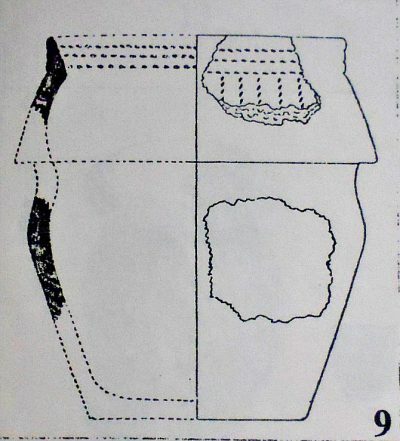 “Fragment of pottery, reconstructed by C.F.C. Hawkes as a small (7½” high) collared urn, found in excavating a limestone cave. Hawkes suggested domestic use. Illustration from Musson (left) 1947 – Plate B.” And also given is the Bibliography: Musson, R. C. (1947). A Bronze Age cave site in the little Bolland area of Lancashire: report of excavation. LCAS 59 (1947) 161 – 170. Please note Bolland should probably mean ‘Bowland’. John Dixon (1992) does not mention Fairy Hole Cave in this volume. However, he does tell that a Roman or Bronze Age Camp used to exist opposite the Keeper’s House in Whitwell village, according to W. Thompson Watkin (1883) who referred to the earlier 1849 ‘Topographical Dictionary’ (7th Ed.) by Lewis; but that all traces of this have gone. John refers to Whitaker’s ‘History of Whalley’, adding here that that author mentions there used to be the remains of a small encampment and also a cairn of stones which contained a kist vaen and skeleton opposite the same Keeper’s House. The Keeper’s house is now the local inn. So maybe both authors were talking about same site?, John suggests. John also adds that in 1984 a large round stone was found in the river near to the inn. On closer inspection, archaeologists declared the carved-out stone to be a mortar used for grinding food grains, and they dated it to the Bronze Age. This stone is now locally known as ‘The Whitewell Stone’, which is today housed in the hotel in the village. Dixon, John & Mann, Bob, Journeys Through Brigantia (Volume Eight) The Forest of Bowland, Aussteiger Publications, Barnoldswick, 1992. Edwards, Margaret & Ben, Lancashire Archaeological Bulletin, Vol. 10, No. 2/3, May & July 1984. Thomlinson, Sarah & O’Donnell, John, Life In Bronze Age Times, (A Resource Book For Teachers), Pendle Environmental Studies Group, Curriculum Development Centre, Burnley. FAIRY HOLES CAVE – WHITEWELL. 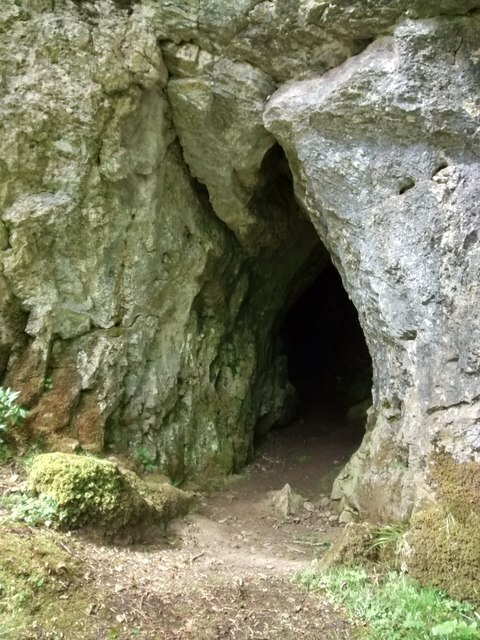 Categories: Archaeological Sites, Caves & Rock Shelters | Tags: Fairy Holes Cave at Whitewell in the Forest of Bowland in Lancashire | Permalink.